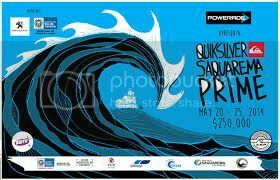 Quiksilver Saquarema Prime presented by Powerade runs from May 20th -25th at Praia de Itauna, Brazil. Stu Kennedy, current WQS rated 36th and reigning Le-Ba Open Champ, will be there chasing the Qualification points. Stu belongs on the CT and is getting close. Get behind him on Facebook and give him a boost. Stu surfs in Ht20 in the round of 96. Good luck mate. Stu surfed a very patient heat in the round of 96, in clean but inconsistent conditions. The ASP has implemented 4 man priority for this event and there will be some teething problems but Stu used it to his advantage. Commentators were calling him the basement dweller for most of the heat but Stu was just waiting for a good one. A good one came and he threw down a full rotation frontside air and then backed it up in the final minutes to finish 2nd. Unfortunately Stu finished 3rd in the Round of 48 and was eliminated. Next event in the QS is the Los Cabos Open of Surf in Mexico, June 16th.